Klinge Corporation’s Dual Refrigeration Systems have two full capacity reefer units with performance monitoring and there is also an option for an integral generator set. 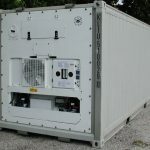 The box container refrigeration unit automatically switches to its back-up in an emergency to provide the ultimate peace of mind for chemical transport, pharmaceutical transport, or dangerous goods transport. This switching happens following each defrost cycle in order to ensure equal run time for the components of each system, and also allowing for constant checking that the backup system is ready for full operation. Klinge also provides a solution with one or two generator sets to provide the utmost security. A higher cargo temperature option is also available with heating to maintain typical pharmaceutical chilled cargo in the 2-8°C range. 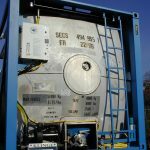 Klinge Group’s line of Dual Refrigerated Containers comply with international regulations for the transport of Dangerous Goods. They are available with container tracking (satellite monitoring & GSM) and temperature recorder for added security. Klinge Group has been providing Dual Refrigeration Systems to major chemical and pharmaceutical companies around the world since 1984. Contact a Klinge Group Specialist Today! » Ideal for high-value cargo when extra redundancy is required to prevent temperature excursions. » Available with “Ultra-Cold” package allowing for operation in ambient temperatures down to -50°C. 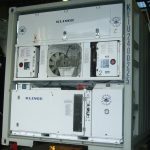 The Dual Refrigeration Systems are used to transport hazardous chemicals, resins, adhesives, pharmaceuticals, ice cores, ammunition and other goods requiring extra protection.